Another month, another set of samples. This month for Future Music we've been happily abusing drum machines and children's toys all in the name of art. Yep it's circuitbending time again! For anyone not in the know, circuitbending is the term given to modifying electronic toys or machines to basically short circuit the sound chips so they let out streams of glitches, squawks and other strange noises. 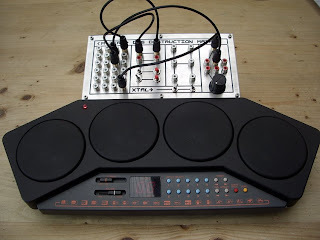 Now we're a little parcel to a session of circuit bending here at GCHQ so have a few modded bits and pieces laying about, including our bent TR 505. Anyone not on personal terms with the 505 (and even if you are) might find this description taken from http://www.circuitbenders.co.uk/ amusing. "The Roland TR-505, a classic piece of kit! This Drum Machine is an essential feature of many studios throughout the whole world. Wherever there is a studio door that needs to be wedged open the 505 finds its true purpose as a door stop and does the job with a simple elegance which we can all admire. Never has a piece of music kit been so vastly overrated". A bit harsh perhaps, but it is true that the humble 505 isn't exactly the most inspiring drum machine Roland ever built. Anyway we own a couple so sacrificed one upon Mr Hoodees alter of solder and screwdrivers. What we added was a 16 way mini-jack patchbay that mucks with the sound in all sorts of odd ways. And by the magic of the interwebnet here's a little vid! Although enthusiastic dabblers we're also not too proud to call in the experts sometimes, and had our new mate Shane at Minority-Zero add one of his shiny Destruction Matrix patchbay's to our old Yamaha DD6 drum machine. Using RCA leads to patch some crazy burps, squeals and screams out of this down at heel preset drum bank is a joy to behold, with the added bonus of it looking great as well. The whole 'making it look nice' part of bending really passes us by, due to lack of skill and Patience to be honest. And what a beauty she is, we're well pleased and will hopefully post a video of her in action when we get a min. If you do a search on Ebay for minority-zero you might see some of Shanes other fab creations - highly recommended.